The team at Volkswagen have clearly worked hard to fill the new Passat with state-of-the-art technology. From semi-autonomous parallel parking to top-of-the-line audio capabilities, the latest model is proof that the everyday midsize sedan can exceed your expectations, and it’s available now at Commonwealth Volkswagen. One of the first pieces of technology you’ll notice when you enter the 2017 Volkswagen Passat is a 6.3-inch touchscreen, which can be used to control everything from your eight-speaker, 400-watt Fender premium sound system to your GPS navigation system. You’ll also be able to use the App-Connect feature to access Apple CarPlay and Android Auto technology. Providing the next-generation of smartphone integration, such software allows you to quickly sync your smartphone with your Volkswagen Passat; you’ll then be able to stream music, use apps, or call contacts from your touchscreen. SiriusXM satellite radio enhances entertainment even further, and you can even access VW Car-Net Guide & Inform for enhanced navigation or SiriusXM Traffic to escape gridlocks in the middle of Haverhill or Lowell. And convenience doesn’t even wait until you get inside. With the available hands-free Easy Open trunk, your can access cargo space automatically as you pass your foot beneath the rear bumper while the key is in your pocket. Front Assist: Sensors detect possible collisions and provide a warning alert. Should you fail to react, Autonomous Emergency Braking will deploy. Blind Spot Monitor: This system helps prevent you from changing lanes when there is a car in your blind spot by disseminating an icon on the relevant side mirror. Rear Traffic Alert: This program scans left and right to warn you of vehicles approaching from the side as you reverse. Lane Assist: Expect a warning if you start to drift from your current lane without signaling, as well as corrective steering pressure if you fail to respond. Park Assist: Take the work out of parallel parking, as this system scans for available spaces and takes care of steering to guide you safely into place. Adaptive Cruise Control: Radar technology helps keep a preset distance between your Volkswagen Passat and the vehicle ahead. 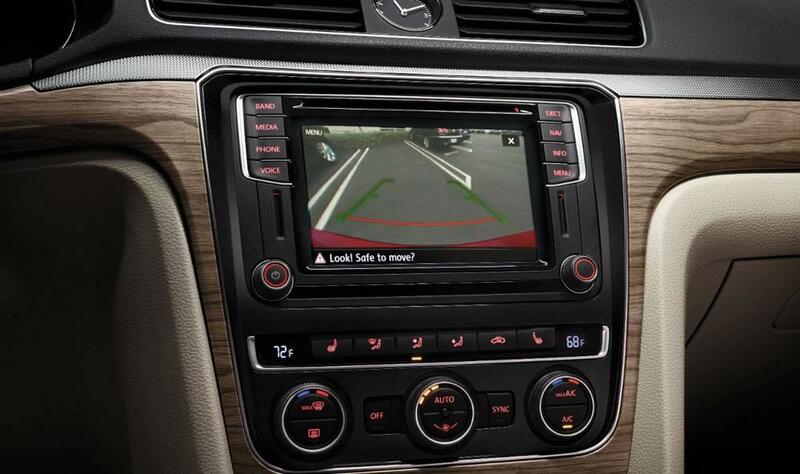 Park Pilot: Sensors in the front and rear let you know how close you are to obstructions during low-speed maneuvers. Whether you need to slip into a tight parking space in Methuen or enjoy commercial-free radio on the way from Andover to North Andover, you’ll find that the new Volkswagen Passat has technology available to meet your needs. To find out more or arrange a test drive, contact the team at Commonwealth Volkswagen today.